UPDATE: Please see May 6 post HERE. Thanks to everyone reading. 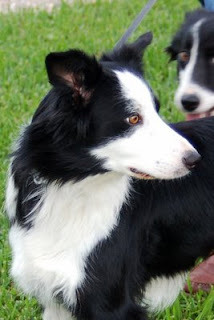 These two beautiful female Border Collies need loving homes! They have been spayed, vetted, and cared for. They are house and crate trained, and walk beautifully on the leash. Won't you give one of these sweet, loving girls a "forever" home? (Caveat: Border Collies should not be adopted by families with small children, as the dogs want to herd them...). I will deliver these dogs anywhere in the continental US (partly because I do not believe in shipping animals, partly because I want to see to whom and where these babies are going). Bessie is ready to GO! 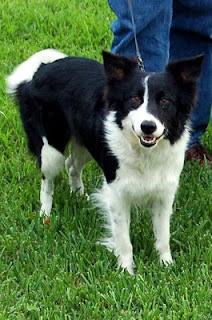 She is a full-blown Border Collie: energetic, full of life, smart, playful, inquisitive, loving. Energy and endurance off the scale. She is DYING to be somebody's pet. She loves to be around her people. She loves being taken for walks, playing tug-o-war, and playing with a squeaky toy. House-trained, crate-trained, walks well on the leash. She is heartworm-positive but is responding well to treatment (see * below) She is spayed and has had all her shots. She would love a forever home and someone to play with! Bonnie (“Bon Bon”) loves treats and fun, but is more contemplative than her sister. She is very sweet and loving, and would love nothing better than to sit on the sofa with you while you watch TV. She walks well on the leash, and is a joy to take for walks. Give her a squeaky toy and she’s occupied for hours! Honestly, she will steal your heart; you can't help but to pet her every time you see her. House-trained, crate-trained. She is heartworm-positive but is responding well to treatment. (see * below) She is spayed and has had all her shots. Won’t you give this sweet, loving girl your heart? More pictures of these beautiful girls are available here. For a wealth of information on this most intriguing, energetic, fun, complex, and fascinating breed, go here. (I post on the forums frequently). *Heartworms: Most cases of Heartworm are treatable in the early stages, which is where these girls were caught (they have a "Low positive"). Because there was no evidence of microfilariae (the stuff from which baby heartworms come) in the blood, the treatment consists of one Heartguard tablet per month (which EVERYONE should do for ALL their dogs ALWAYS, ANYWAY). What will happen is that the adult worms now present will die naturally over the course of the year and the Heartguard keeps any new microfilariae at bay. After a year or so, the dog is heartworm free. There are other treatments but this is what my vet recommended. Heartguard is $39.95 for a six-month supply at 1800PetMeds, or from your vet. It does require a prescription. All of my dogs are on it and have been since I got them. I posted a link on the HI board. If I didn't have to many dogs myself I would take them off your hands Malvie. Thanks, P'Cola, your comment "miss you on the message boards" means more to me than you know.